Can you partner with us? There are a number of ways to help us with the Pentecostal Gold Archive. Help us spread the word about the archive and the great preachers on the site. We are interested in the known and unknown. Every preacher must be either 70 years of age or deceased and we must be able to get permission to use the sermon. We will not post pirated sermons. We want to maintain this as a free site, but obviously we have expenses in maintaining the site. If you have been blessed by Pentecostal Gold, please pray about making a contribution toward our monthly hosting expenses. You can give using the paypal link below. 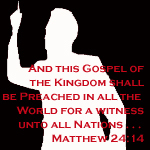 All Sermons on Pentecostal Gold are the exclusive property of the copyright owner. They may not be downloaded, copied or reproduced in any form without the permission of the copyright holder. Copying from this website is illegal and unethical.